San Jose, CA — Atlona Technologies is offering a Universal HDMI adaptor capable of adding an HD Audio Video output to any computer via USB. Called the AT-HDPiX, this new solution is designed to add a HDMI port to any computer, Mac or PC. The HDPiX has limitless applications in both consumer and commercial environments. 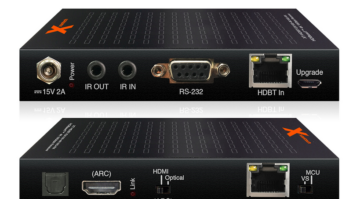 From digital signage to home theater, the HDPiX provides a simple solution for viewing content from a computer on any HDTV at a maximum resolution of 1600×1200 or 720P. The device features a small form factor, which allows it to hide behind computers or displays. Because the unit takes audio from the 3.5mm stereo jack from the computer, rather than through USB connection, the entire 34 Mbps bandwidth of the computers USB connection can be used to transfer HD video. This ensures high-quality video playback without dropping frames during high motion video such as sports, or video games. Audio from the computer is embedded with the video and transferred to an HDTV over a single HDMI cable. The HDPiX is will begin shipping before Christmas with a MSRP of $179.